I live in Michigan. It gets to be a snowy wonderland that no one wants to visit many, many months out of the year. Summer however? I can’t fend off visitors with a stick. Kidding. I would never do that. I love visitors. As someone who loves to cook and bake and has never mastered the art of scaling back a recipe for 2, it’s ideal to have people around. 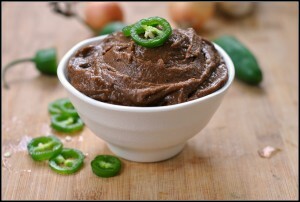 Bonus if the people around love to eat and are adventurous in trying new foods. In Austin, at BlogHer Food, they served a Basil Lemonade. I almost skipped past the lemonade all together because I normally stick to my rule of not drinking calorie-containing beverages unless they’re coffee-containing or alcohol-containing. Silly little rule of mine that works almost all of the time. Something about this lemonade caught my eye…or perhaps it was my nose. 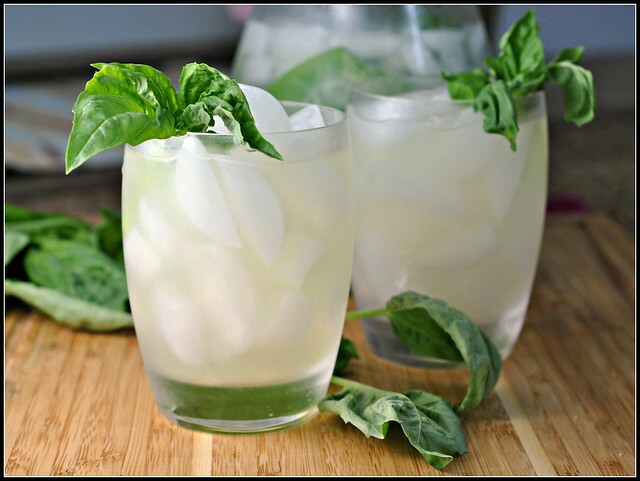 Basil lemonade. One sip and I was sold. Heavenly was this lemonade. In order to not break my rule again, however, I was steadfast in my efforts to recreate this beverage, sans the guilt of empty calories from sugar. I squeezed the juice from 9 lemons, added in ice, water, and basil, and mixed in liquid stevia, along with some powdered stevia. 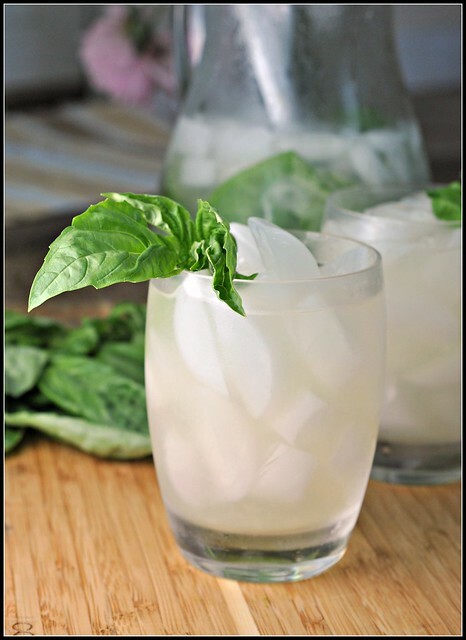 I left my Basil Lemonade fairly tart which was enjoyed by all, but the beauty of using an all-natural, calorie-free sweetener is that you can add as much, or as little, as you wish without altering the nutritional make-up of the recipe. This totally hit the spot. So glad the Fourth of July is right around the corner…I think this will be perfect! Summer has never been so refreshing! Juice lemons and transfer to a pitcher. Fill the pitcher with ice and add 8-10 cups of water, or amount until desired tartness. Add basil leaves and swirl and mash gently with a wooden spoon in the pitcher. Sweeten, to taste, with stevia or other sweetener. I served this to my parents and in-laws and I must say, it was a hit! 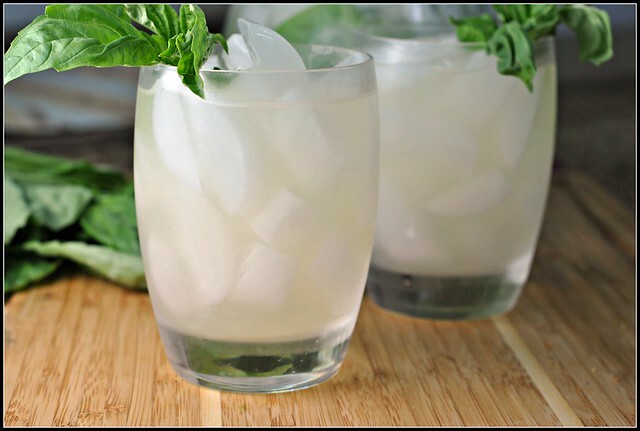 So refreshing, incredibly easy to make, and a guilt-free beverage perfect for summer entertaining! I love your rule, I follow the same one, of course. I mean beer or a foamy latte, of course that’s the worth the calories! 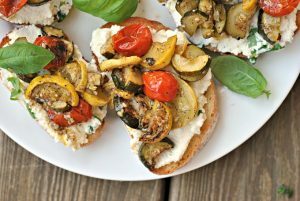 Great recipe, and yes, perfect for the Fourth. Yum. We’ve got basil growing strong in our garden! I am the same way about beverages… it’s water, coffee, or beer for this girl 🙂 This looks great, though! I’ve never had that before but it screams summer! At least you can hang with your friend and her Mom after work! Love your drink rule. 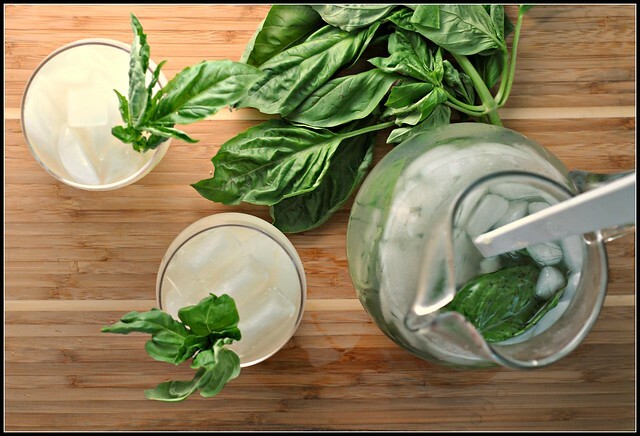 I’d say I’m pretty much the same…minus the basil lemonade on my blog today (coincidence!). I’m curious how it would’ve turned out with stevia. I used a honey/simply syrup combo. this looks yummy and an interesting combo of flavors. I will try it soon! I’m sold! Basil is one of my FAVORITE ingredients. I double the amount of normal people in pasta, spaghetti sauce, even pesto… I’d never thought to pair it with lemonade, but that’s brilliant!